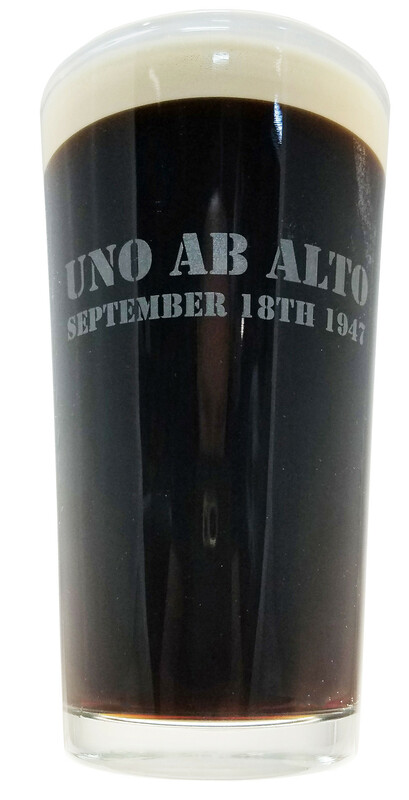 These high quality 16 ounce pint glasses feature the Air Force motto (Aim High: Fly-Fight-Win) etched on one side with the Latin expression Uno Ab Alto (one over all) on the other, along with the date of the creation of the Department of the Air Force. 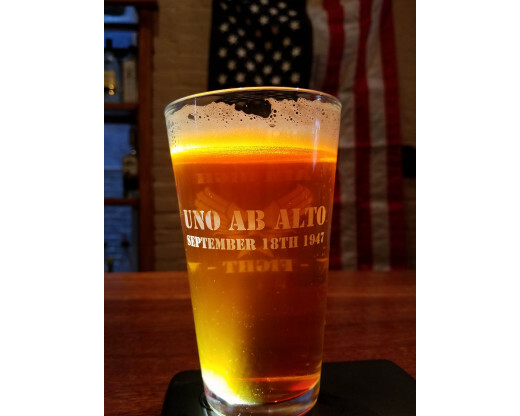 These pint glasses are made in the USA. They make great gifts and are available in single or multiple quantities. Simply select the quantity you'd like from the drop down below. 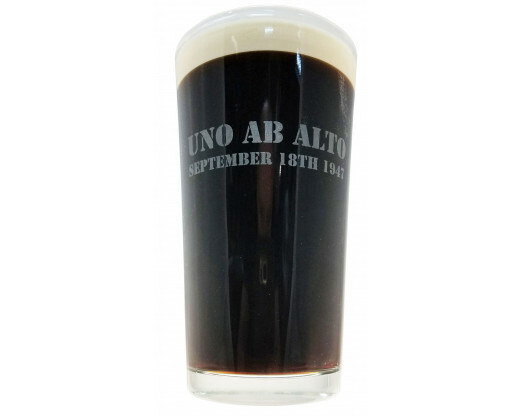 They are also included in our exclusive Military Pint Glasses Set which features a pint glass from each of the five military branches. 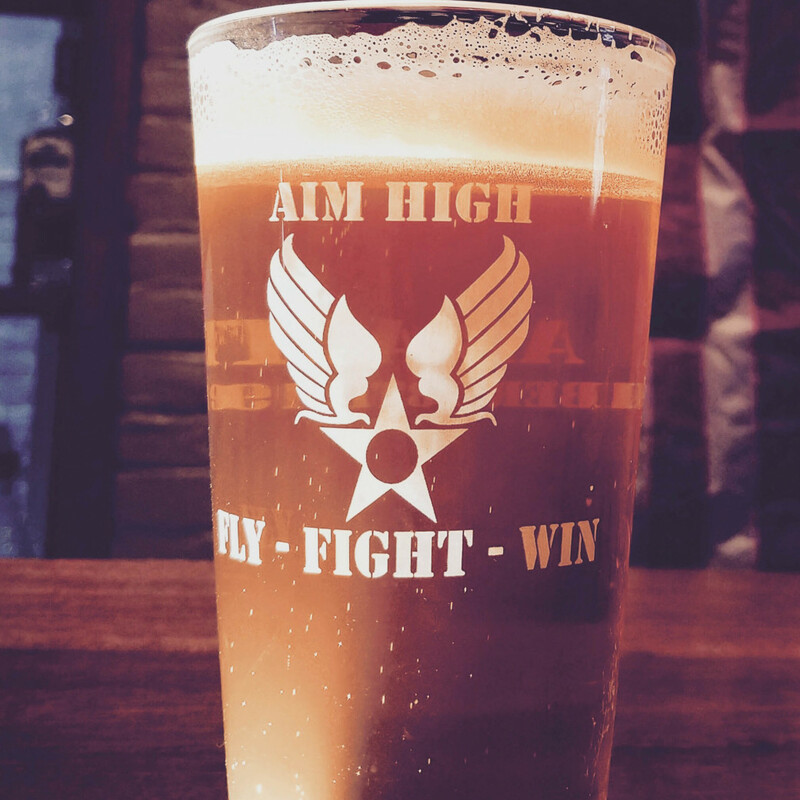 Check out our Air Force pint glasses in our new series: Share a Drink. Share a Story. A veteran airman talks about the importance of all roles within the Air Force and the moment he heard about the September 11 attacks. 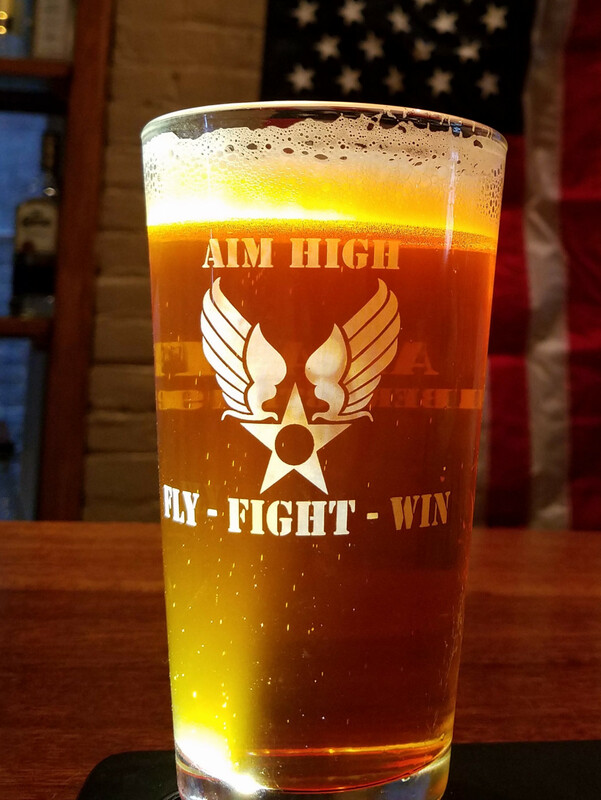 Order these Air Force pint glasses for yourself or for your favorite veteran / fellow airman! 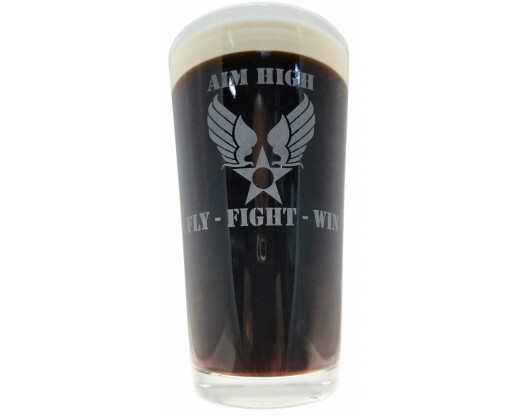 Interested in other military themed pint glasses? 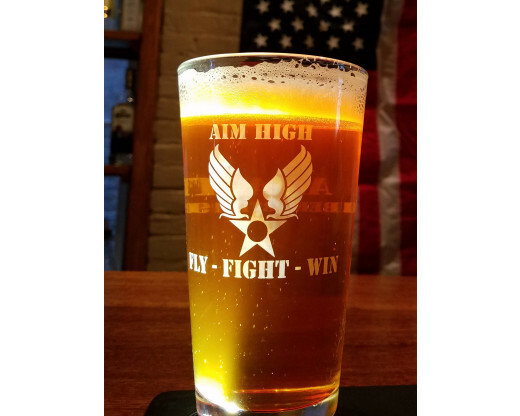 Browse Marine Corps, Navy, Coast Guard and Army pint glasses here! Looking for additional Air Force products? Browse them here! The seal of the United States Air Force is one full of meaning. The seal is encircled by thirteen stars, representative of the original thirteen colonies. It features the unwaveringly American symbol of the bald eagle with its wings spread to represent constant readiness. The bald eagle itself is known for its striking power in the air, a characteristic that is emulated by the Air Force. 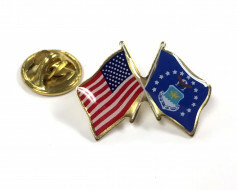 Within the eagle's wingspan are three of the thirteen stars; these three stars are intended to portray the Army, Navy, and Air Force which comprise the three departments of the National Defense Establishment. Behind the eagle is a cloud, symbolic of sky and in the eagle's talons is a wreath with the Air Force's colors of silver and blue alternating. Below the eagle is a shield bearing a heraldic thunderbolt, another symbol of striking power in the air. Another symbol that is synonymous with the United States Air Force is the Hap Arnold symbol. This was the symbol of the United States Army Air Corps which predates the Air Force. 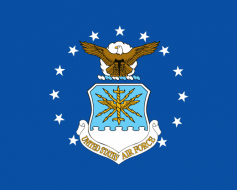 The United States Air Corps operated as part of the United States Army until 1947 when it was declared its own department and renamed the Air Force. Until this time the Hap Arnold, which features a white star with a red circle in the center and gold wings to its left and right, was the official emblem of the Air Corps. 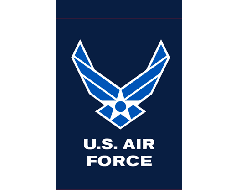 Today, it is still easily recognizable as an Air Force symbol and is even the basis for the new symbol used by the Air Force. The Air Force has also had several mottos over the years. 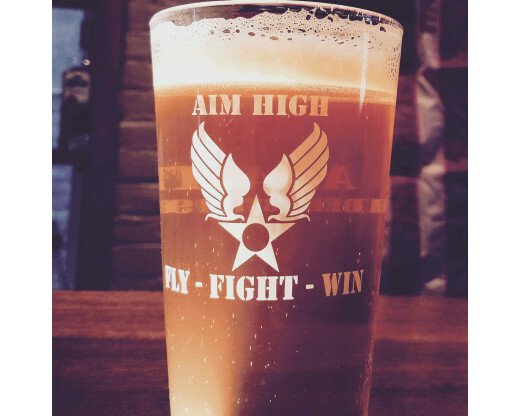 Their Latin motto, “Uno Ab Alto,” translates to “One From on High.” In 2010, through months of research, the Air Force developed a new motto meant to encapsulate all Airmen from the ground up: “Aim High... Fly-Fight-Win.” The new motto is truly a call to action with “Aim High” meant to trigger a response of “Fly-Fight-Win” from any other Airmen in the vicinity. Interested in other products featuring the Air Force logo and motto? 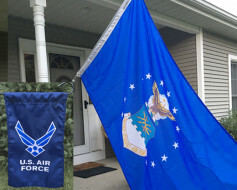 Air Force Category: Browse Air Force flags and other Air Force products here. This was a father's day present for my father who served for 27 years. 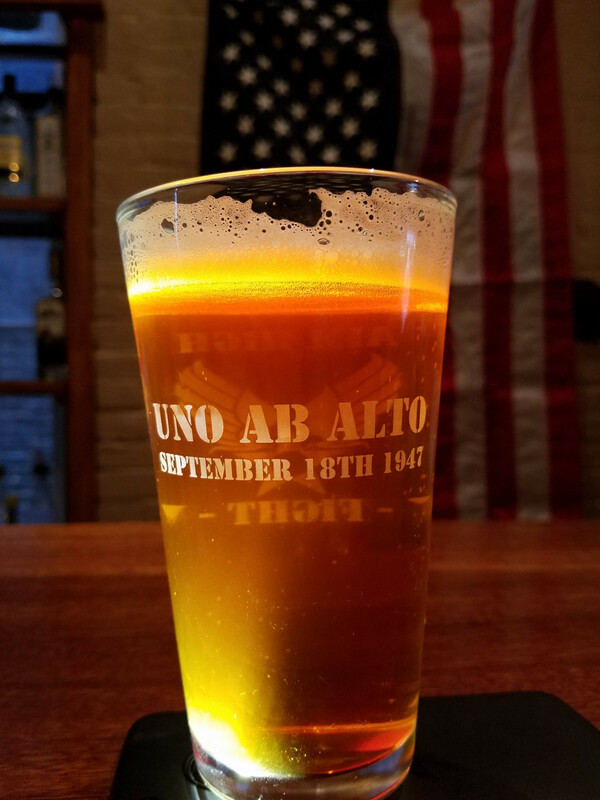 The glass was just as advertised and was a great value for the quality.